Since I can remember, I've always loved the Super Bowl... But it was never for the actual game. I love any good excuse for a party, and the only thing I ever REALLY love about the Super Bowl is the food that comes with it. 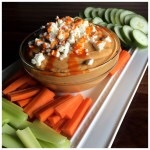 I have picked my favorite dips and snacks for those folks who care more about the food than the game! See Video for these recipes and their beer pairings! Visit Memphis Craft Beer for more beer info and perfect game day beers!